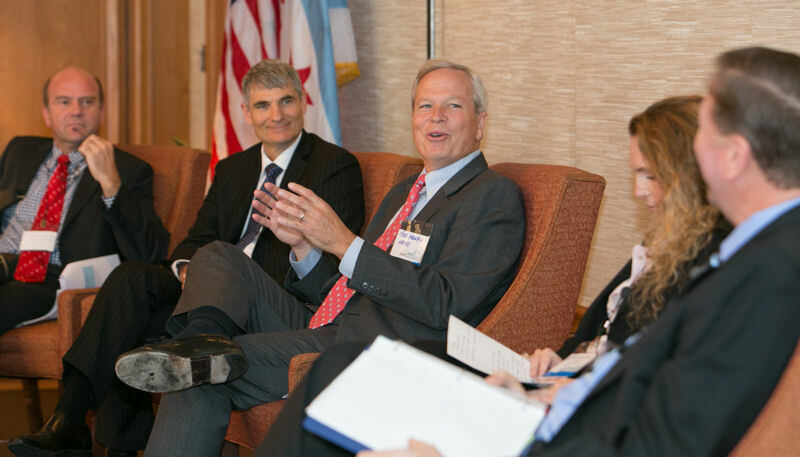 Speakers sit on a panel during the Chicago Water Summit 2014: Global Lessons From Great Water Cities. From left, panelists Christian Guenner, director of System Development with Hamburg Wasser (Germany); Peter Grevatt, director of EPA’s Office of Ground Water and Drinking Water; Ted Henifin, general manager at Hampton Roads Sanitation District (Virginia Beach, Va.); Tali Landau-Ofter, finance director at TaKaDu Ltd. (Yehud, Israel); and moderator David St. Pierre, executive director of the Metropolitan Water Reclamation District of Greater Chicago, participate in the summit. Photo courtesy of Kieffer Photography. Attend the Great Water Cities Summit 2015: Collaborating for a Resilient Future to learn about challenges in the water sector from experts. Professionals from around the world will travel to Tulane University’s Lavin-Bernick Center in New Orleans, July 21–22, to discuss water sector issues such as collaboration, managing water in extreme conditions, workforce development and economics, and innovation and investment. The Water Environment Federation (Alexandria, Va.), Greater New Orleans Inc. (New Orleans), and the Sewerage and Water Board of New Orleans are hosting the summit. 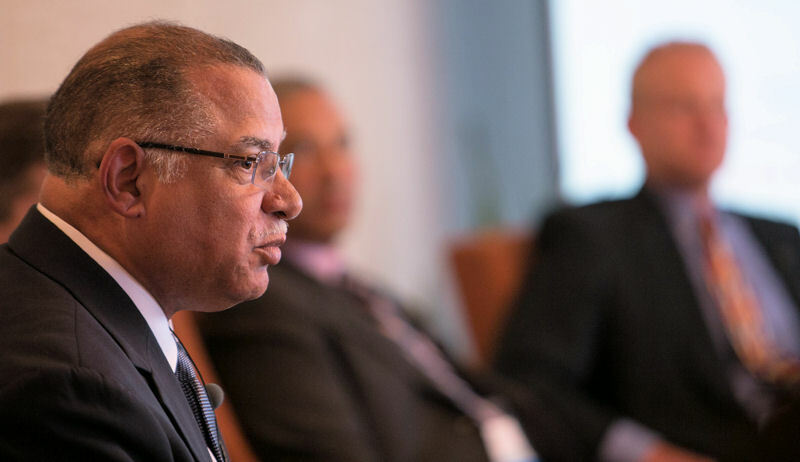 Cedric Grant, executive director of the Sewerage and Water Board of New Orleans, talks on a panel at the summit. Photo courtesy of Kieffer Photography. Through panel discussions, networking sessions, a luncheon, and peer-to-peer connections, attendees can learn about various topics from leaders and peers. Speakers including Adel Hagekhalil, assistant director of the City of Los Angeles Bureau of Sanitation; Karen Pallansch, chief executive officer (CEO) of Alexandria (Va.) Renew Enterprises; Mike Eckert, chairman of the NOLA Angel Network (New Orleans, La. ); Martin Vilhelmsen, project manager at RAMBOLL (Copenhagen, Denmark); and Sue Schneider, CEO of Spartanburg (S.C.) Water. Attendees also have the option of taking a tour of key water facilities and participating in a welcome reception on July 21. 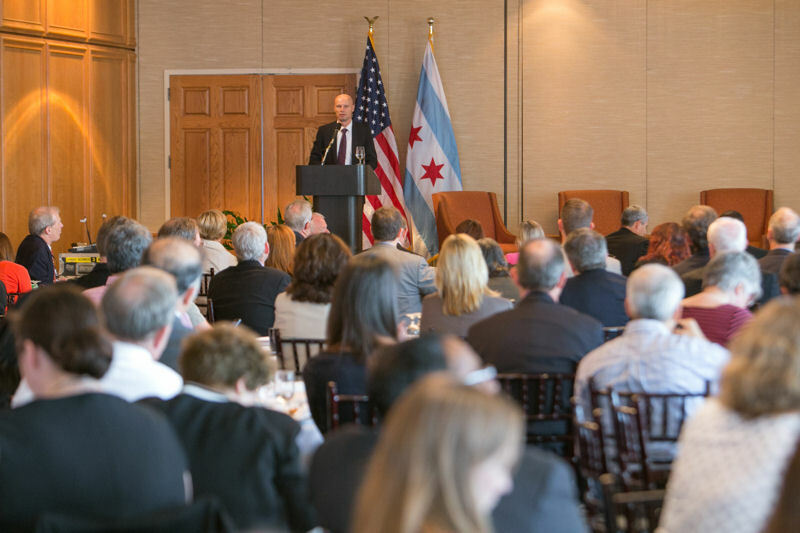 Henk Ovink, principal with Rebuild by Design (New York) and senior advisor to the secretary of U.S. Department of Housing and Urban Development, provided the luncheon keynote during the Chicago Water Summit 2014 luncheon. Photo courtesy of Kieffer Photography. Register now for $260 and reserve a hotel room. The conversation will continue during the water leaders’ session, The Impact of Leadership: Culture, Communication and Community in Great Water Cities, during WEFTEC 2015.